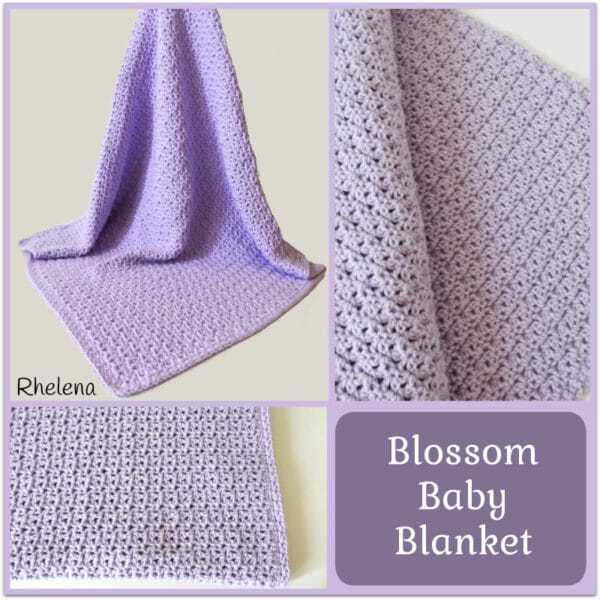 The blossom baby blanket crochet pattern is crocheted up with the blossom stitch. I love this stitch because it gives you a nice appearance on both sides of the fabric. 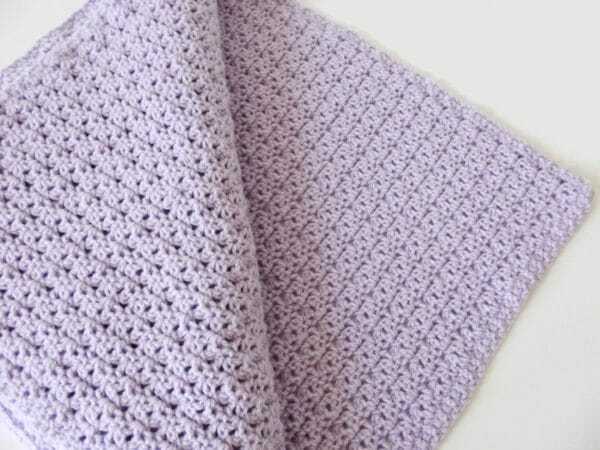 It makes for a lovely baby blanket for little girls, but in the right colors, you could just as easy crochet this up for boys as well. It’s shown here in a solid color, but why not try it in pretty baby stripes or even a rainbow color. Babies love color, so the more you add the happier they will be. 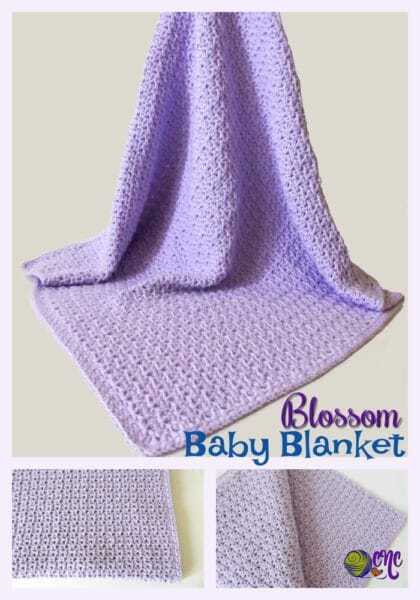 The blossom crochet blanket measures about 30″ by 30″, making it perfect for the crib or the stroller. However, you can easily customize this to fit your needs. In a simple multiple of 4+1 you can increase and decrease this in size for a full-sized afghan for yourself, or a doll blanket for your little girl. And it doesn’t have to be square, you can easily continue to do more rows for a nice rectangular baby blanket. It’s got a bit of lace to it, so it’s great for the summer months, especially if you use a cotton yarn. And also, it would make for a lovely baby shower gift at your next baby shower. As for yarn, the stitch looks great in almost any yarn, so feel free to substitute as you like. And it doesn’t even have to baby yarn either, as long as it’s soft and baby safe, you can use any yarn you want to make this baby blanket. And you want to make sure to use a hook size appropriate for the yarn you use. What I liked best about this baby blanket crochet pattern is that it allowed for mindless crochet once I got started on it. The blanket is worked in two pattern rows that are repeated, so it’s just a matter of remembering which row you are on. I found this to be a great project to work on at night before bed to help me relax for a good night sleep. And for new moms-to-be, I’m sure it would be a great way for them to relax as they await for their new bundle of joy to arrive. The blossom crochet stitch looks great if worked in rows, but you can also work this in rounds. It’s an easy stitch to master and looks great in many projects. And it’s got a touch of elegance, making it a great go-to stitch for weddings and other fancy occasions. Other baby blanket patterns that you might enjoy are the seed stitch baby blanket, or this quick and easy chunky broomstick lace baby blanket. Gauge: Measures 2.5″ over 3 V-sts. Here is a photo tutorial for the Blossom Stitch, to help with this blanket. Ch 137, or any multiple of 4 + 1. Row 1: V-St in 3rd ch from hook (first skipped ch counts as turning ch and first sc), *sk next ch, sc in next ch**, sk next ch, V-st in next ch; rep from * across ending last rep at **. (34 V-Sts) Turn. Row 2: Ch 4 (counts as first dc and ch-1 sp), *(sc, ch 1) in v-st, (dc, ch 1) in next sc; rep from * across working last (dc, ch1) into turning ch of previous row. Last ch-1 made counts as turning ch and first sc for next row. (68 ch-1 sps) Turn. Rows 4-91: Rep rows 2-3. Rnd 1: Sc evenly around working 3 sc into each corner and making sure to end with an even number. Join with sl st in first sc. Rnd 2: Ch 1, (sc, dc) in same st as join, *sk next st, (sc, dc) in next st; rep from * around; join with sl st in first sc. Fasten Off. If you enjoyed this blossom crochet pattern, you might also enjoy more patterns with this stitch here. The blossom summer beach bag could be modified into a diaper bag with a simple lining. Here is a step-by-step tutorial on how to line a bag. Here are more free crochet patterns for babies. Add the pattern to your Ravelry account or purchase the PDF here on Craftsy. At first glance, I thought this was just a V-Stitch blanket, but looking closer at the pattern, I can see it’s a variation of it. The V-Stitch is one of my favorite lacy look stitches, especially for Spring/Summer scarves – I will now have to add the Blossom Stitch to my list, and this baby blanket! Pinning. How many skeins of yarn do you think you used? I worked off a 14 oz ball, so don’t know how many small skeins you would need. Thank you so much for the pattern for this beautiful baby blanket.and thanks for making it free. I also want to thank you for putting the mulitples that are needed to make this a different size. That helps tremendoulsy because sometimes I can’t figure out the multiples when I want to change sizes. I love this!! My vertical rows seem to go on a slight diagonal. The “blossoms” don’t quite line up in a checkerboard patter, rather they tilt at a very slight angle. Do you think this has something to do with yarn tension? I know I am following the pattern directions properly. Maybe if I block the afghan when I’m done it will get more square? Help! Thanks! I can’t remember if it slanted or not… would you mind sending an image of what it is doing to [email protected]. If it’s not too bad, you should be able to block it out, but it’s hard to say.